Back to article: The extracellular matrix of mycobacterial biofilms: could we shorten the treatment of mycobacterial infections? 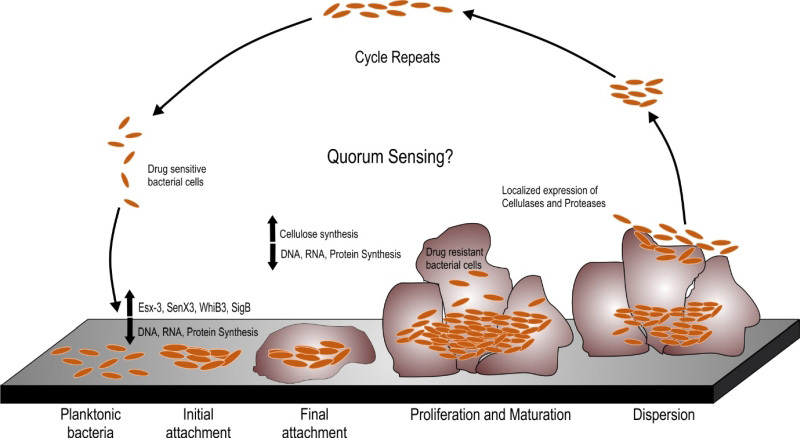 FIGURE 1: The biofilm formation and dispersal cycle. The planktonic bacteria form biofilms through a series of steps, which involve the initial attachment of the cells to a substratum followed by biofilm maturation and proliferation of bacteria within the matrix and finally a part of the matured biofilm dispersing to another site for subsequent localization and attachment. During this process, bacteria undergo phenotypic changes. Several genes playing roles in virulence and redox sensing are upregulated. Biofilms formation is associated with upregulation in cellulose synthesis during maturation of the biofilms; however, localized expression of cellulases and proteases degrades the extracellular the matrix of the biofilm thereby leading to bacterial dispersal followed by start of a new cycle of biofilm formation.